Since establishing himself among the Denver area’s elite jazz musicians, Peter Sommer has contributed his energetic saxophone playing and creative spirit to a wide variety of musical projects ranging from mainstream bebop to avant garde and beyond at venues across the nation and around the world. Peter has performed with the Dallas Symphony Orchestra, the Colorado Symphony Orchestra and the Colorado Music Festival Orchestra, and has been a featured jazz soloist at North American Saxophone Alliance Regional and Biennial Conferences. He has also performed at IAJE International Conferences in Anaheim and Toronto, Canada, and has performed at World Saxophone Congresses in Valencia, Spain, Bangkok, Thailand and St. Andrews, Scotland. He has also released four albums as a leader, most recently Narrando Historias (2015) on Dazzle Recordings. Peter Sommer is Associate Professor of Jazz Studies and Saxophone at Colorado State University in Ft. Collins. At CSU, Mr. Sommer directs Jazz Ensemble I and coordinates the Jazz Studies area. The New Third Stream Quartet was formed in the interest of combining the rhythmic and improvisatory language of contemporary jazz with elements of modern chamber composition. The saxophonists in the quartet are all accomplished jazz and classical saxophonists, and performances focus on the creative energy of progressive jazz as well as the precision and communication found in traditional saxophone quartets. The flexibility of jazz improvisation is balanced with the rich harmonic and timbral colors of 21st century classical music. The quartet’s repertoire consists primarily of commissioned works and the ensemble is dedicated to encouraging composers to unite jazz and classical styles. The NTSQ gave its inaugural performance at the World Saxophone Congress in Bangkok, Thailand in 2009 and has performed at subsequent WSC’s in Scotland and France, at North American Saxophone Alliance conferences, in numerous recitals across the US, and most recently at the Jeju International Wind Ensemble Festival in South Korea. The NTSQ’s CD One for Four is available on Teal Creek Records. Rick VanMatre Soprano Saxophone Rick VanMatre has presented solo recitals and jazz club performances in the US, Europe, Israel, Braz . . .
James Bunte Alto Saxophone Dr. James Bunte is an active recitalist, giving recitals and master classes throughout the United St . . .
Peter Sommer Tenor Saxophone Peter Sommer has contributed his energetic saxophone playing and creative spirit to a wide vari . 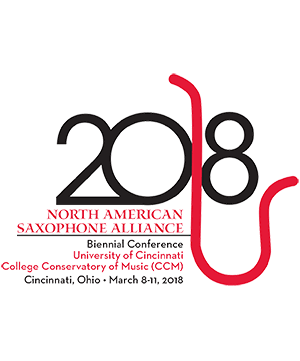 . .
James Romain Baritone Saxophone Dr. James Romain serves as Professor of Saxophone and Assistant Director of Jazz Studies at Drake Un . . .